Delaney Park is one of the most sought-after neighborhoods surrounding Downtown Orlando. The neighborhood’s namesake park is one of the oldest in Orlando, originally called Duckworth Park. It encompasses 7.25 acres of ball fields, green space, pavillions and playground. With brick streets, mature trees, beautiful parks and views of the skyline rising above its two lakes, Lake Cherokee and Lake Davis, Delaney Park neighborhood boasts some of the larger estates in the area, but still has some smaller single-family and quirky multi-family homes mixed in to make for a diverse population. While not a designated Historic District, there are plenty of homes dating back to the early 1900s that have been beautifully restored. This neighborhood also feeds into one of the best school districts in Orange County, with children able to attend Blanker School (K-8) and Boone High School. Homes in Delaney Park do not stay on the market long. Whether historic or new construction, because of its convenience, beauty, and schools, many homes are put under contract within days or hours of being listed. Renovations do not need Historic Board approval, and neither do tear-downs, so if you can find the right home or the right lot, customization is always possible. Like other Downtown-surrounding neighborhoods, you’ll find a diverse group of residences in Delaney Park. From boutique post-war apartment buildings that are perfect for medical residents, nurses, and young professionals starting out, to colorful two- and three-bedroom bungalows with deep front porches and jalousie windows, to meticulously maintained Mediterranean homes with antique pine floors, high ceilings, and private guest houses overlooking lush backyards, if you’re looking for variety, this is the place you should call home. 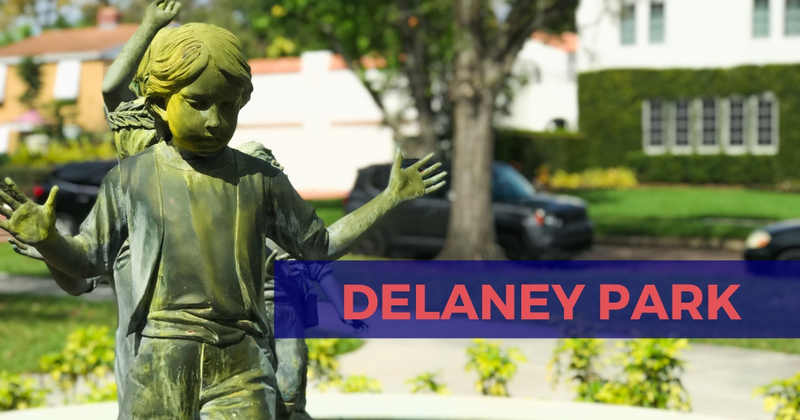 Like the other Downtown neighborhoods, the draw of Delaney Park is its proximity to venues, shopping, city parks, and special events that happen in the City Beautiful. Adjacency to Orlando Health, City Hall, and the Courthouse means you’re likely to have a doctor, lawyer, or even social media influencer as a neighbor. Footraces and festivals are common, and neighbors gather at places like 903 Mills Market, a deli and wine shop located on the east end of the neighborhood, or at Delaney Park itself, home of the Delaney Park Little League baseball fields. Each 4th of July, residents avoid the crowds at the Lake Eola Fireworks Show and settle in at Cherokee Park with lawn chairs, picnic blankets, games, children, and pets to watch the fireworks flash above Lake Cherokee and the Orlando Skyline. Walkers and runners will enjoy endless routes along lakes and through shaded parks with stroller- and pet-friendly sidewalks. For those who like to socialize and keep up with their neighbors, there are very active neighborhood associations and social media pages. Ready to call Delaney Park home?